In blender, place enchilada sauce, onion and 1 tablespoon of the taco seasoning mix; cover and blend until smooth. Reserve 1/4 cup of sauce, and pour remaining sauce into baking dish. In medium bowl, stir chicken, beans, corn, 1/2 cup of the cheese, remaining 1/4 cup of blended sauce and remaining taco seasoning mix. Divide chicken mixture among chile halves, and arrange in baking dish. 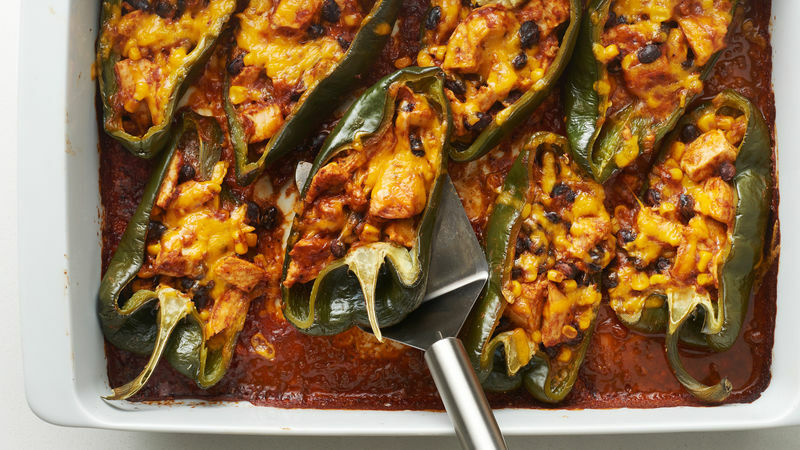 Cover with foil; bake 30 to 35 minutes or until chiles are tender and filling is heated through. Remove foil; top with remaining 1/2 cup cheese. Bake 4 to 5 minutes or until cheese is melted. Serve with light sour cream or salsa. When handling chiles, be sure to wear kitchen gloves to protect your hands, and be careful not to touch your face or eyes. The seeds and membranes of chiles can cause burns. Always wash your hands thoroughly after handling chiles.